Karen Hudes Shocking Revelation : Fort Knox Gold is Buried in The Philippines !! Do Gold Miners Need to Lead the Metals? This holiday-shortened week (Monday was President's Day in the US), the price of the dollar fell. In gold, it fell almost half a milligram to 24.75mg, and prices in silver it dropped 30mg, to 1.7 grams of the white monetary metal. Flipped upside down, gold went up 23 notes from the Federal Reserve, and silver appears to go up by 41 cents. How could this be possible? Doesn't the law of supply and demand work for gold? 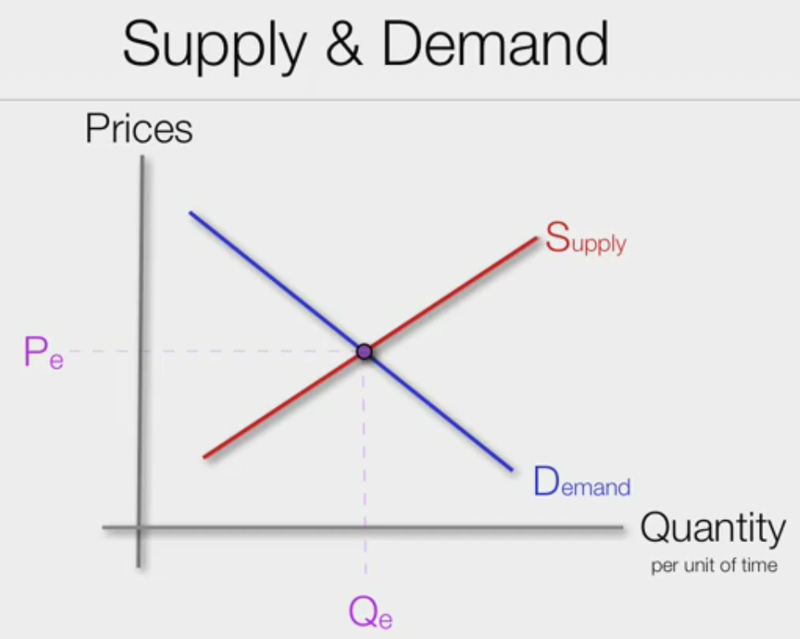 You know, the standard "X" graph from Econ. 101? Gold has several unique properties. One is that it is not purchased for consumption, but for monetary reserves or jewelry (which in most of the world is monetary reserves). Contrast that to copper which is purchased by plumbing manufacturers to make pipe. It's a competitive market, and if the price of copper plumbing goes up too much then home builders will switch to plastic. Demand drops as price rises. Also, the marginal copper mine will increase production. Supply rises as price rises. It is self-correcting. The trend of falling dollar (i.e. rising price of silver) and rising cobasis (scarcity) is here in silver, too, but it's weaker. The fundamental price of silver is now up to about $18.70. While this is over the market price of the metal, it's not nearly so much above as gold. Top money manager, John Ing recently presented to China his forecast for $2,200 an ounce. Our guest is bullish on gold, in the LT. Bob Hoye notes that during every previous post bubble contraction, the real price of gold has ascended, making the PMs a solid portfolio asset, today. Andy Schectman of Miles Franklin Institute ($6 billion in sales) outlines why every investor should diversify their PMs holdings via an offshore account. In 1933, President Roosevelt announced an executive order designed to confiscate gold that included at $10,000 fine. In response to a FOIA request the US Mint has finally released reports drafted from 1993 through 2008 related to the physical audits of the US official gold reserves. However, the documents released are incomplete and reveal the audit procedures have not been executed proficiently. Moreover, because the Mint could not honor its promises in full the costs ($3,144.96 US dollars) of the FOIA request have been refunded. Gold researcher Koos Jansen reports tonight that the U.S. Mint has provided him with some documents in response to his freedom-of-information request for documents related to audits of the U.S. gold reserve but the documents provided are incomplete, redacted, and hundreds of pages short of the number of pages he was told were involved for which he was charged, and so the Mint has refunded his payment. As the money for his payment was raised by crowdfunding from his readers, Jansen is refunding their contributions. This is more proof that something dishonest has been going on with the U.S. gold reserve. VANCOUVER, British Columbia, Canada -- Golden Predator Mining Corp. (TSX.V: GPY; OTCQX: NTGSF) is pleased to announce it has commenced a 20,000-meter drill program at its fully owned 3 Aces project in southeastern Yukon. The drilling program will initially focus on targets in the Spades Zone, where 2016 results included a new vein discovery at depth plus 7.5 meters of 33 grams-per-tonne gold at the Ace of Spades. It’s a common misconception that miners always lead the metals sector. As you can see in this chart the miners often produce false signals. GATA Chairman Bill Murphy's presentation Friday at the Dollar Vigilante Internationalization and Investment Summit in Acapulco, Mexico, was titled "GATA and the Gold and Silver Markets" and the notes for it are appended. Hello, everyone. It is great to be here. I want to thank Jeff Berwick for the invitation to make a presentation on behalf of GATA and for the opportunity to see a number of friends again, ones made over so many years. GATA was formed in January of 1999 by Chris Powell and myself to thwart the manipulation and suppression of the gold price by the leading bullion banks. It became apparent this was the case after the very visible hedge fund, Long Term Capital Management, blew up in September of 1998. They were short some 400 tonnes of gold on their books, which should have been covered, liquidated like all their other positions. To prevent the price of gold from soaring in that event, the likes of a JP Morgan and Goldman Sachs banded together to keep the price below $300 an ounce. No one knows this better than their attorney at the time, Jim Rickards, who has gone on to gain huge visibility in the gold world. And no one knows better than Jim Rickards how right GATA has been all these years, even though he took public exception in the WSJ back then to what we had to say -- but who some 12 years later spoke at one of our conferences in London. As time went by, GATA learned the operation was much bigger than we initially thought and included the Fed, US Treasury, Exchange Stabilization Fund, BIS, and other central banks. Our term for the lot of them is the Gold Cartel. In essence, we learned we would be taking on the most substantial money and power in the world. Right after inception, only a few in the gold world would give us the time of day. "Deutsche Bank has been especially aggressive and noticeable in their selling the past few days. We got word late this afternoon that their bullion desk is calling their clients saying that the gold price is stopping at $290." The very next day the Bank of England announced, in advance, they were going to sell some 400 tonnes of gold, or more than half of their gold. It was unprecedented in that no entity which wants to get as high a price as they can would announce such a sale in advance. This stunning event was the beginning of some very visible people in the gold world, such as James Turk, coming into the GATA camp. From the beginning we decided to be an activist organization -- not just to talk about the problem, but to do something about it. So, this presentation is first about this effort and what it has led to recently. But then more importantly, why what GATA has learned is going to lead to an explosion in the gold/silver prices, and probably in the not too distant future. -- Ironically enough, just a few weeks after our inception, I was interviewed by Ron Insana of CNBC. Once they heard what GATA had to say, that was it. Have not been invited back since. -- We have gone to Washington numerous times to see what we could do. -- Met with James Saxton, chairman of Joint Economic Committee. -- Congressman Ron Paul too. -- And James Hastert, speaker of the House. Who hastily set up a meeting that afternoon with Spencer Bachus, chairman of the Subcommittee on Domestic and International Monetary Policy. Delivered this "Gold Derivatives Bank Crisis" packet to members of Congress during the trip to meet with Hastert. There was a well attended gathering in D.C. which was televised by C-Span. Those trips to Washington were made in our early years, and gave us an inkling of what we would be up against. -- Many years later another trip to Washington would prove further how formidable our opposition was. I had met with CFTC Commissioner Bart Chilton, who was willing to give us the time of day. GATA was then invited to speak at a CFTC hearing in March 2010, which included a number of our issues. -- Being able to introduce London's Andrew Maguire's documentation how JP Morgan was rigging the precious metals. -- GATA's Board member Adrian Douglas coaxing antagonist Jeff Christian to disclose that the LBMA trades 100 times the gold it has to back it up. -- And the hearing was televised on the internet with ONLY my five minute testimony blacked out, which was right out of a Hollywood B movie script. Returning to GATA's early period, we mobilized numerous GATA supporters to write to members of Congress to get truthful answers about what was really going on with America's gold, etc. Many, many letters, such as this one from Denver's Hank Fellerman were sent to House and Senate members. Yeoman efforts were made with various members of the financial market press to bring attention to the manipulation of the gold and silver markets. No one in the world has done more in this regard than my colleague Chris Powell. -- Then there was mega effort made to get the word out there by going to the press via some ads. Here are two in particular. And this WSJ ad in 2008, which cost a small fortune -- $264,000. Love to have that back, if we only knew then that nothing about our subject would be able influence the bought-off financial market press and affect the big money and power in the America. -- We don't have a free press in America. Veteran Bloomberg News gold reporter Claudia Carpenter told John Embry, Chris and I in London she is not allowed to mention GATA, and she has not all these years. -- We don't have free markets either. In addition to The Gold Cartel we learned there is a Plunge Protection Team constantly operating in our stock market, and so on. -- No free press, no free markets. So much for fighting the Communists all those years for being the same! -- In that regard my colleague Chris Powell has long said the U.S. would rather release our nuclear secrets than our gold secrets. And the press knows this, so they just won't go there. They are too afraid of the repercussions for doing so -- which by itself reveals how correct GATA is. But, after all these years, there is the potential for a blockbuster change and one reason has to do with this GATA ad. Based on what we have learned, GATA believes a good portion of the U.S' 8,135 tonnes of official gold reserves are not there -- ergo the ad. The U.S. cannot legally sell any of our gold without an Act of Congress. However, we can swap our gold with another country and sell that country's gold. We believe this has occurred as part of the gold price suppression scheme. No one knows about the status of our gold reserves because there has not been an official audit since 1955 or so. So why a potential change now? Only that it would fit into the manner in which President Trump is operating and in terms of his "cleaning up the mess he inherited." -- If it is revealed a fair amount of our gold is gone as GATA believes is the case, the dollar would tank badly, which would be a huge boon for his pledge to change the jobs picture in America. -- He can blame this eventual scandal on his predecessors and fortify his reputation as a truth teller. -- And if all our gold is revealed to not be all there, Trump can blame a resulting explosion in the gold price on his predecessors and not due to economic policies he is putting in place. According to former Fed Chairman Paul Volcker, and others, gold is regarded as the barometer of U.S. financial market health. Up is bad, down is good. A gold market scandal would completely defuse that notion as it relates to that barometer in terms of current U.S. economic policies. Time will tell on that one. Hope springs eternal. -- Before starting my own internet site, I worked with Frank Veneroso who wrote The Gold Book, which gained all kinds of notoriety in the late 1990's. It is the backbone of GATA's discovery about the gold price manipulation scheme, as Frank exposed the fact that central banks were secretly leasing out their gold, which was suppressing the price and why we think a fair amount of the U.S. gold is gone. We also decided to speak at as many conferences as we could. Over the years CP and I have been to England, Germany, Hong Kong, Singapore, Fairbanks, Alaska, Palm Springs, Glendale, Arizona, Spokane, Washington, Vancouver, Toronto, South Africa, etc. to make presentations on behalf of GATA. -- 2001 in Durban, South Africa. -- 2005 in Dawson City, way up in The Yukon. -- 2008 right out side of Washington, D.C.
All the conferences were well attended from people all over the world. The speakers were terrific, much fun, and in some cases electrifying. There is no way to do all of them justice in this presentation, but want to make a note for a few reasons on the first South African conference, which received some coverage by SABC and was attended by representatives of five African countries. Before the conference I toured South Africa to drum up interest, making presentations to such disparate people as the South African Central Bank, who just snickered … And to Zulu monarch, King Goodwill Zwelithini, great grandson of the legendary Zulu leader, Shaka. Around 100,000 Zulus work in South Africa's gold mines. What an engaging man. And then there is the distinct memory of meeting the renowned Brett Kebble, who helped put GATA on the map with a $50,000 contribution so we could hire our first legal firm to take on The Gold Cartel. Brett was assassinated four years later. Former attorney Reg Howe, Frank Veneroso, and James Turk came over to make presentations. Reg went on to sue the entire Gold Cartel in a Boston court. It was Reg against the world and nine lawyers representing the BIS, Goldman Sachs, Deutsche Bank, J.P. Morgan/Chase, Citigroup, the U.S. Treasury Department, the Federal Reserve Board, and the New York Federal Reserve Bank -- which is as good a representation of The Gold Cartel in one room as you will ever find. Which leads us to GATA suing the Fed, spearheaded by my colleague Chris. and we received a check for nearly $3,000 from the Fed for its illegally withholding a document. As mentioned, Frank was the one who discovered the gold leasing scheme by the central banks and he made a supply/demand presentation in which he stated the longest the central banks could hold out suppressing the price was 10 years. Fast forward 10 years: 2011, one month following GATA's London conference in August of that year, gold took out $1,900 on the upside and it appeared Frank's analysis could not have been more spot on. But then it all began to fall apart. In retrospect we did not realize how the use of financial market innovation (a.k.a. derivatives) could be mobilized to engineer a multi-year, devastating attack on the gold and silver prices. How much has it fallen apart? The third of those speakers who traveled all the way to Durban, South Africa on GATA's behalf, the highly regarded James Turk, recently stated that if gold had just been allowed to keep up with inflation in the U.S. (based on the CPI numbers since 1934 when gold was $35 an ounce), it should be $3225 today. That is how much The Gold Cartel has interfered with the gold price. So here we are, all these years later with The Gold Cartel still visibly making their mark on the precious metals via blatant attacks in the paper markets. Anyone who follows the price action on a daily basis knows what that is all about. GATA consultant James McShirley, a lumber company CEO who spoke at GATA's London conference, has documented for years just how precisely The Gold Cartel operates. -- Stopping the price of gold on 1% advances on a given day, sometimes to the tick. -- Selling around 10,000 contracts per 1% of a price advance. -- Selling at precisely the same time of day. -- Not allowing any follow-through after a good day, etc. At the same time, after all these years, it appears that GATA's time is at hand and just starting to be so. To begin with, many of our critics have been silenced by some recent lawsuit revelations which have revealed how correct we have been. The most stunning and disgusting of all is what was revealed in early December in the lawsuit against Deutsche Bank (there they are again) when a judge released 150,000 pages of documents and 75 audio tapes to settle charges in that suit. The revelations implicated other bullion banks "in a very serious way." What caught everyone's attention was the specific verbiage. Then, how about this exchange on May 11, 2011 when silver was still not far from $50 an ounce. DB: you guys short some funky options? UBS: By the way keep it to yourself. There were 150,000 pages of that stuff. Silver has never had a chance since then, well until about now, which we will get into. A U.S. appeals court on Wednesday revived three private anti-trust lawsuits accusing JPMorgan Chase & Co. of rigging a market for silver futures contracts traded on COMEX. This is the same JP Morgan, the biggest silver short on the Comex, who has been burying the price ever since the top of the market near $50. It's going to take some time for these continuing lawsuits to get resolved. But, the cat is out of the bag on what GATA has been banging the table about all these years. And then it even gets a bit better. Wikileaks revealed a cable from the early 1970's which was sent to the State Department from the US Embassy in London and describes the embassy's extensive consultations with London bullion dealers about the imminent re-legalization of gold ownership in the United States and possible substantial gold purchases by oil-exporting Arab nations. The cable reads: "The major impact of private U.S. ownership, according to the dealers' expectations, will be the formation of a sizable gold futures market. Each of the dealers expressed the belief that the futures market would be of significant proportion and physical trading would be minuscule by comparison. Also expressed was the expectation that large-volume futures dealing would create a highly volatile market. In turn, the volatile price movements would diminish the initial demand for physical holding and most likely negate long-term hoarding by U.S. citizens." This is a big deal in my opinion because it is a direct linkage between the U.S. Government and bullion dealers to deflect interest in the gold market. Nothing has changed over the last 43 years. The Gold Cartel is still at it in the most sophisticated of ways. Now, that is all fine and dandy to be aware of. What is most important is how does this all affect the gold/silver markets and your investing in the sector? IMO the most important fact to appreciate is that gold and silver are presently at incredibly low artificial prices -- ones that have been forced down all these years due to the suppression scheme. Remember what James Turk said about what that $3,000+ gold price should be just if it had kept up with inflation. Will get into silver in a bit, but first some reflection on the most remarkable/stunning market development I have witnessed over the last 45 years and it has to do with the Trump election and aftermath. -- Before the election, one in which few thought Trump would prevail, each time there was any serious indication he had a serious chance to win, the Dow would plunge and the gold price would pop. There was little to NO commentary from the elite in the mainstream financial world touting how an unexpected Trump win would be so great for the stock market. None from no one! Well, we all know what occurred immediately after the election and since then. Going back to right pre-election thinking, what has occurred would have been called beyond confounding -- with the DOW soaring and soaring and gold getting bombed. My opinion is that the PPT and Gold Cartel were fully prepared for the election outcome and were laying in the weeds ready to make their moves. They knew what had occurred following the unexpected Brexit win and weren't about to allow that sort of market reaction again, especially with insider concerns over the real fragility of our markets and economy. Petrified of a Trump win, they needed to change the investment world's psychology about what a Trump win would mean. In essence, this meant a 180 degree change of perception about the win -- from a disaster to fantastic. Price action makes market commentary. And boy did it work. With our stock market indices making record high after record high, American investors are the happiest of campers. The question for us is where do gold/silver investments go from here as today is the first day of the rest of our lives? Will leave the stock market to smarter minds than mine, but I have some very strong opinions about gold and silver, and they are quite bullish as you would imagine. Besides being so undervalued historically, it is my opinion that The Gold Cartel bombed the gold price following the Trump win because they know that he is going to have to inflate the system to save the system. At the time they were still massively short gold and silver. The bombing terrorized speculative longs who exited their positions in droves. As a result the gold open interest on the Comex (which is the number of long and short futures positions) fell from its all-time high of 668,000 in the middle of the year to around 388,000 contracts in the middle of December. The silver open interest dropped from 225,000 to 158,000 contracts. The Gold Cartel forces made a fortune. The spec longs were routed. Since The Gold Cartel's blitzkrieg, the precious metals prices have been grinding their way higher and, IMO, are now on their way to all-time highs in combination with the U.S system being inflated to an enormous degree. Also, IMO, it will be silver leading the way in stunning fashion. There are two market veterans who have had my attention over the years about the silver price: David Morgan and Eric Sprott. Since you just heard what David has to say, I am going to reflect on Eric's big picture thought on silver, a thought which has been so wrong in recent years … but one which soon should be so right. Western central banks may be the corrupt and even evil instruments of the financial class, and to preserve their power they may be prepared to do any amount of damage to the world, particularly by destroying markets, the engines of humanity's economic progress. But stupid? Not when central banks have gained and kept control of the world's money and thus control of the valuation of all capital, labor, goods, and services in the world. What's stupid is any society that doesn't rise up against them or at least demand disclosure of their surreptitious operations. If this theory is correct, at least we will have a true American as president and working on our behalf as opposed to a leader giving up the keys to the kingdom and throwing its people under the bus in the name of "fairness"? The "One World Government," or "New World Order Types" as they identify themselves, are strongly opposed to the individual liberty movement rearing it's head here there and everywhere. Seemingly, the "people" have thrown a monkey wrench into their plans for a One World Order; here and there and everywhere. Populism to them is like a rapidly spreading cancer, that must be stopped dead in it's tracks. My assumption is; THE WORLD IS ABOUT TO BE HUNG ON A CROSS OF GOLD. The early stages of Gold bull markets (this one included) are characterized by strong outperformance from the miners. They will lead the metals and turning points and register strong outperformance. We saw that in the early 2000s, late 2008 to early 2009 and we have seen it again over the past year. During the recent rebound, the miners rallied back to the "Trump" resistance while Gold is not yet close to doing so. We saw some volatility come into stocks this past week after the slow solid grin higher we've been enjoying since early November. I do not think this is a top, rather, a little shakeout, or shake and bake. Volatility comes on the upside and downside so we should see some more explosive moves to the upside after this little correction, if you can call it that. The metals continue to show strength even while some miners were flashing weakness mid-week, which had me a bit worried, but gold continues to act great. Technical analyst Jack Chan charts the latest moves in the gold and silver sectors. The Critical Investor takes an in-depth look at Genesis Metals, which is developing a new geologic model for its 100%-owned flagship Chevrier Gold deposit in Quebec.